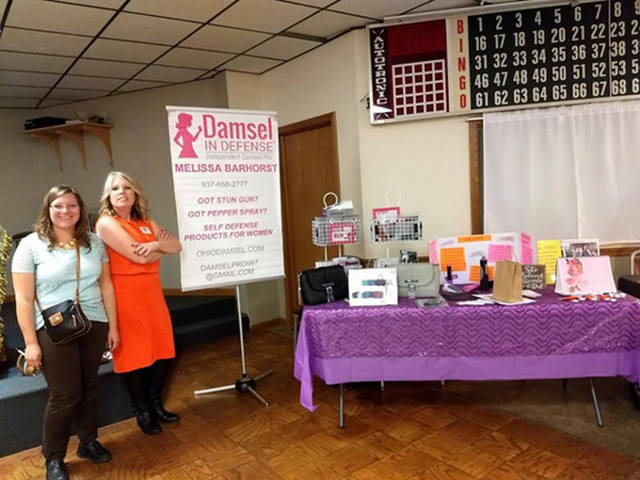 Greenville Business & Professional Women’s Club member Michelle Hook and Damsel in Defense Melissa Barhorst vendor are pictured at the 2017 What a Girl Wants event. GREENVILLE – What a Girl Wants is the theme for this year’s Greenville Business & Professional Women’s Club Annual Guest Night, which will be held on Oct. 11. The event will start in downtown Greenville from 4-6 p.m. with special savings and surprises at selected merchants to be announced. A new business joining the evening is 4One Apparel located in downtown Arcanum. The faith-based company is run by business partners Sara Waldo and Mandy Flatter. The evening will continue at 6 p.m. at the VFW, 219 N. Ohio St., Greenville, with more vendors, silent auction, door prizes, fashion show, cash bar and appetizers provided by J’s Country Market. Ladies of all generations are invited to come, relax, shop and socialize. The BPW club also will launch its “super raffle” at the guest night event. The drawing will be held at the Club’s Dec. 13 meeting. The cost for the What a Girl Wants evening is $15. All proceeds from this fundraiser will go toward scholarships for the young women of Darke County. Last year the club was able to award four local scholarships and is working to increase the number of scholarships offered. More information will be announced in the near future, or individuals can follow the Greenville BPW Club on Facebook. The Greenville BPW Club’s mission is to achieve equity for all women in the workplace through advocacy, education and information. For further information, contact Guest Night Committee Chair Deb Niekamp at 419-305-2178 or BPW Club President Peggy Foutz at 937-670-6511 or through pafoutz@gmail.com.